In the wake of the first meeting between the leaders of Armenia and Azerbaijan to discuss a peace deal for their long-running conflict, a war of words has erupted between the two sides. On March 29, Defense Minister David Tonoyan addressed a group of local Armenians in New York. “As minister of defense, I declare that the formula ‘territories for peace’ will no longer exist, and we will reformulate it as ‘new war – new territories,’” he told the crowd, wearing a military uniform. 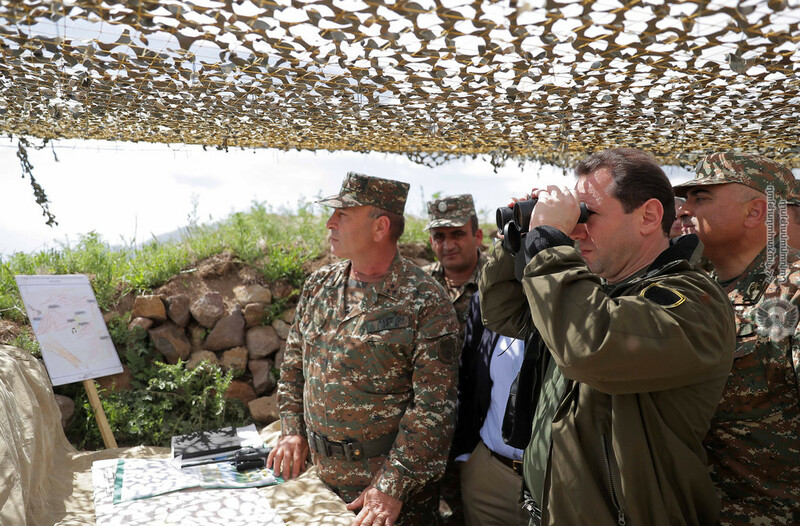 He added that Armenia was aiming to boost its offensive capabilities. None of this was exactly new, but it came at an inopportune time: just as Tonoyan’s boss, Armenian Prime Minister Nikol Pashinyan, was meeting Azerbaijani President Ilham Aliyev in Vienna. That meeting was described as taking place in a “positive and constructive atmosphere,” but the atmosphere quickly darkened as Azerbaijan responded angrily to Tonoyan’s bellicose rhetoric. The press secretary of Azerbaijan’s ministry of defense said it was an attempt by Tonoyan to distract from the “lamentable” situation in the Armenian armed forces, in particular still-murky reports of a mutiny by conscripts in a military base on the Iranian border. “We will bring down a blow on the heads of the Armenian occupants,” said the spokesman, Vagif Dargyahly. That sort of aggressive rhetoric is more commonly heard from the Azerbaijani side, as Armenians enjoy a status quo that favors them. Currently about 14 percent of Azerbaijan’s territory is controlled by Armenian forces, resulting in over 600,000 Azerbaijanis displaced from their homes, and Azerbaijan claims the right to take back that territory by force if peaceful means fail. Still, Tonoyan’s statements aren’t entirely new from the Armenian side. The threat to take additional Azerbaijani territory in case a war breaks out predates Tonoyan’s tenure at the defense ministry. The rejection of the idea of “territory for peace,” meanwhile, echoes similar statements made by Pashinyan himself and could be interpreted variously. Rhetorically, it sounds like a rejection of the very idea of handing back territories to Azerbaijan, a position which would effectively scuttle the peace talks. But parsing the statement more carefully, it could be seen as simply a vow to demand something in return for territories more than simply “peace,” i.e. not being attacked. The more common shorthand for the current negotiating framework is “territory for status” – that is, some exchange of the Azerbaijani territories currently occupied by Armenians for Armenians exercising some kind of formal authority of the core territory under dispute, Nagorno-Karabakh. Neither Pashinyan nor Tonoyan have ruled out that formulation, the bright side on which foreign diplomats involved in the negotiations have focused.